When two indie behemoths come together, something incredible can only come of it. The coming together of longtime friends and tour mates Manchester Orchestra and Kevin Devine, Bad Books' first self titled effort was hands down one of the most cohesive efforts of 2010, but still, it felt like something was absent from the record. It actual fact, it truly felt like more like a split record between the separate acts rather than a collaboration, with Andy Hull having two solo tracks on the record which didn't seem too dissimilar to his side-project Right Away, Great Captain! and Kevin Devine having exactly the same. The craft of songwriting was still incredibly high, however, and really set the bar for the album. 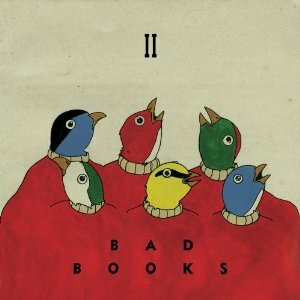 "II" feels like both bands have strayed away from their usual songwriting approach to experiment with new methods of songwriting. The anticlimactic chorus in 'The After Party' really shows a contrast in dynamic that Manchester Orchestra is used to, and it's a welcome change that they move away from their usual formula of loud anthemic choruses and head into a different route. 'No Sides' is a lot more uptempo from Devine's usual singer-songwriter material, however, what sets this song apart from his most recent full-band efforts (showcased on his last LP 'Between the Concrete and Clouds') is the inclusion of Chris Freeman's very subtle synthesizers and additional harmonies by Hull and Robert McDowell (or Gobotron). What's noticeable about "II" is how much the group embrace their influences - from the sludgy Nirvana-esque guitars on 'Friendly Advice' to the distorted drums and synthesizer on the Grandaddy influenced 'Forest Whittaker'. We finally see the light of day on '42' - a track that has been floating around since the release of Manchester Orchestra's first album "I'm Like A Virgin Losing A Child" which came out way back in 2006 - it's from here that the album really brakes to a halt with tracks such as 'Lost Creek' and 'Ambivalent Peaks' to really send this album off properly. Devine's lyricism on the latter really experiments with less of a wordy approach, as he's accompanied by some lush harmonies on the verse "you folded your leg right foot to left knee, you laughed at my back said you couldn't believe how violent I could be, just brushing my teeth", Devine transforms such a mundane thing into a beautifully crafted lyric with so much emotion behind his voice as he sings it. What sets "II" apart from its predecessor then? Bad Books easily feel more like a band. From the passing of the microphone halfway through 'Forest Whittaker' to give Devine a verse as well as Hull providing strong harmonies on songs like 'It Never Stops' to give much more power behind it but still giving each other space on songs like 'Pytor' which features some of Hull's best lyrics to date. "II" easily trumps the band's prior effort and the band feel a lot more comfortable with each other. "II" is out on October 9th through Triple Crown Records.